So, after Argentina and Uruguay, here is the Balance Energético Nacional (BEN) for Paraguay. I turned this into a Sankey diagram using the ktep values and the percentage shares indicated. The structure of this BEN is a little different from the ones previously seen, since it doesn’t indicate the sectors of final consumption. Obviously, most imported crude derivates are used for transport. Regarding biomass, the report indicates that wood is used in households for cooking and sugar cane to produce ethanol to be mixed into fuels for the transport sector. 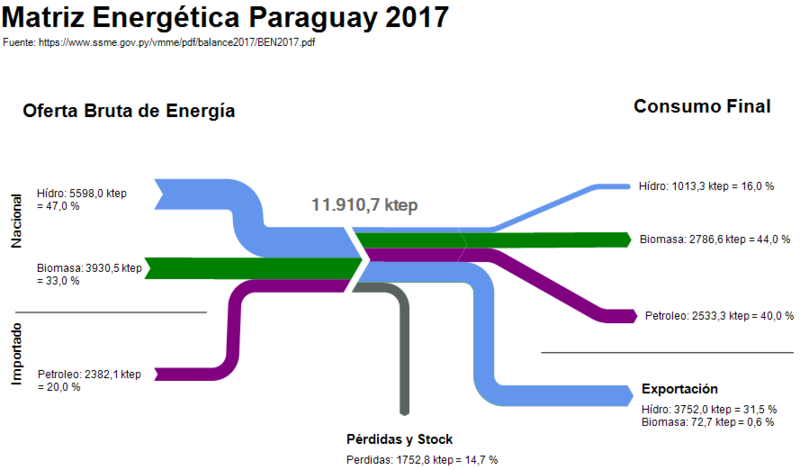 Electricity is produced entirely from hydropower and Paraguay exports over half of the electricity generated to its neighbours Argentina and Brasil.